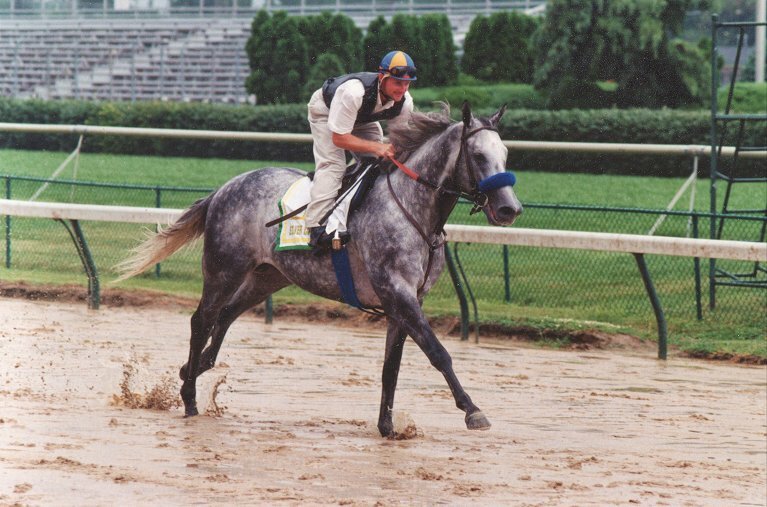 Silver Charm in his racing days. Photo by Laura Battles. Excitement is rising at Old Friends – and we’re very busy! – as we prepare for the arrival of 1997 Kentucky Derby and Preakness winner Silver Charm at the end of the month. If you missed the news, here’s the original announcement in the Blood-Horse. As most readers of this blog probably know, Silver Charm will not be available for visits immediately. 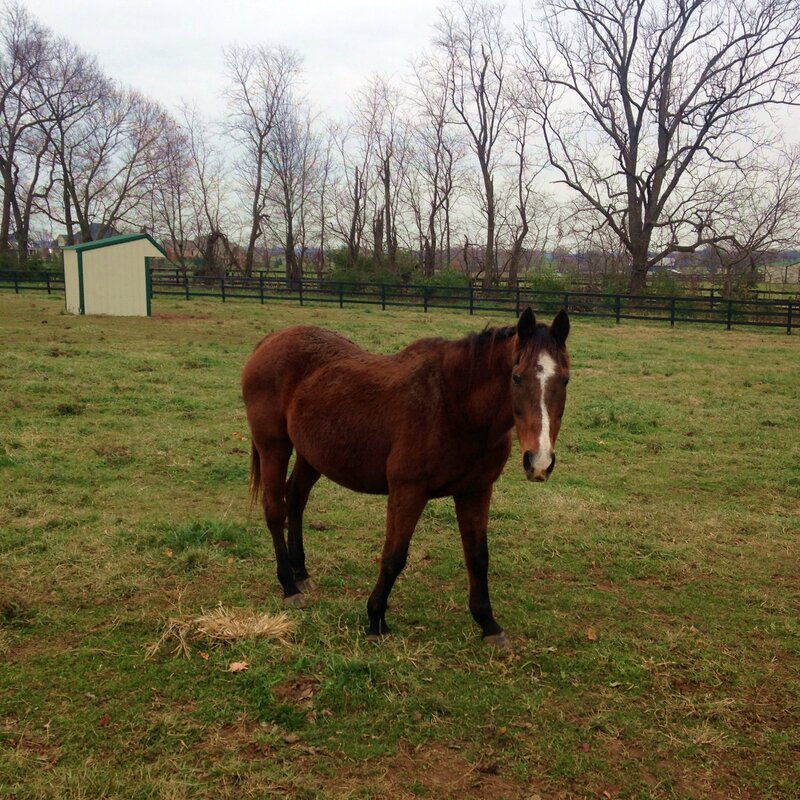 Like Game On Dude and Amazombie a few months ago, he will be in quarantine. We take the safety precaution of quarantine very seriously and will enforce it. Here’s our barn manager, Tim Wilson, explaining why quarantine is so important Tim starts at 1:05, but don’t skip Dude and Amazombie (or the end)! 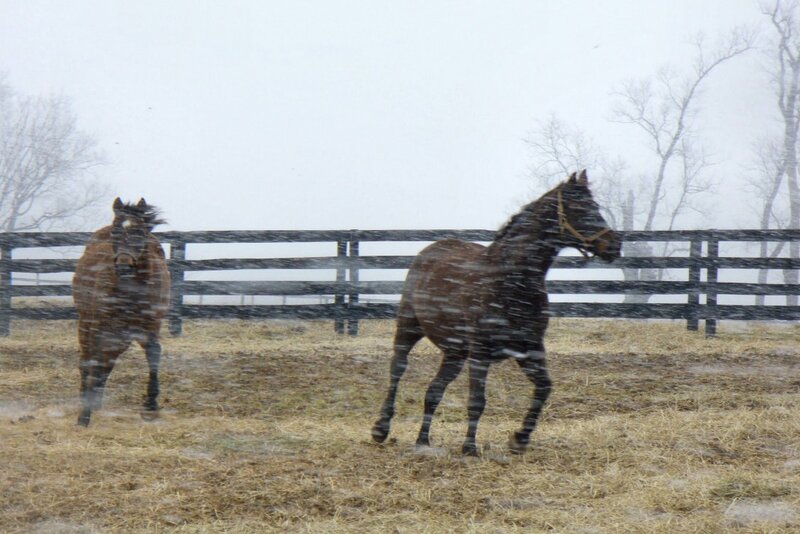 But soon as quarantine is over and the 1997 Derby and Preakness winner has had a chance to settle in comfortably, we have all kinds of fun in the works. We hope you’ll come visit Silver Charm and participate in the other celebratory events with us! Keep your eye on the OF web site, Facebook page and this blog for more information. Silver Charm’s upcoming arrival, and Ava Lotta Hope’s unexpected going from us, have combined for me in good memories and warm thoughts of another mare we loved and remember with fondness, smiles, and gratitude for the happy times she shared with us: Silver Charm’s mother, the tough-knocking race horse, superlative dam, and lovely, lovely lady, Bonnie’s Poker (1982-2010). It’s prompted me to go back into my old photos and I’d like to share a few pictures of her during her years at Old Friends. They’re not up to Laura’s standards, just snapshots, but I hope you’ll enjoy them. 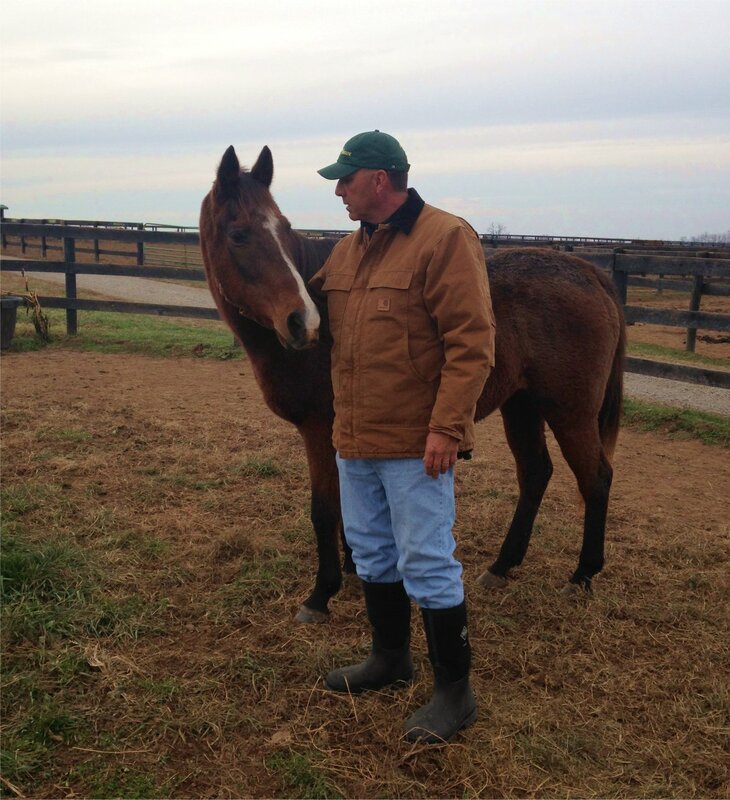 I hoped to post a blog following Johannesbourbon’s journey from race horse to well-adjusted member of one of our gelding herds, a happy story typical of many of Old Friends’ gelding residents. That post will follow soon. First, I must share some more sad news. 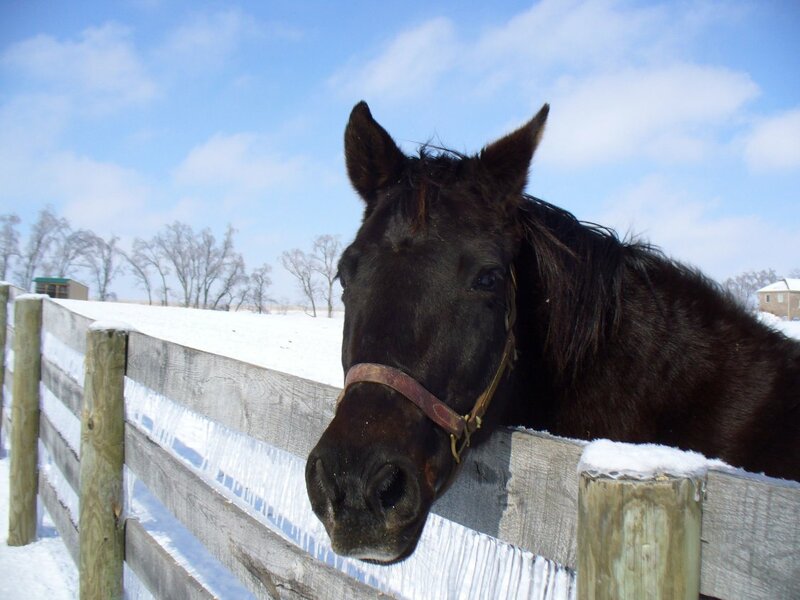 One of our sweetest mares, Ava Lotta Hope, died on Monday. She went unexpectedly, but peacefully, of apparent heart failure. She was 27 years old. Ava Lotta Hope was a daughter of Graustark’s Belmont winner son, Avatar. Her dam, Hope Is Special, was by Broadway Forli. Hope raced 18 times and won a maiden claiming race at Charles Town and a claiming race at Delaware Park. She also got 3 seconds and a third and lifetime earnings of $8,712 for owner Stoney Run Farm and trainer Donald Saville. 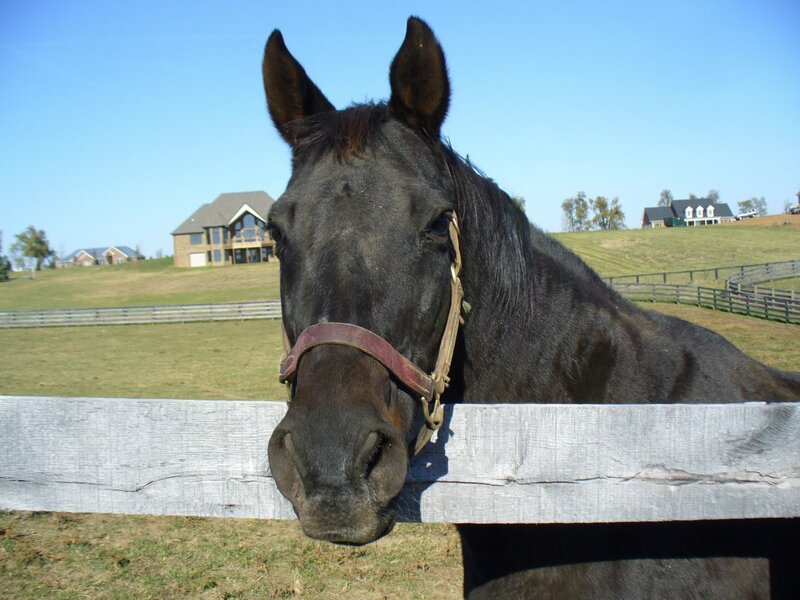 In Virginia, Hope was dam to 4 winners, two with earnings of over $100K, but she was not a highly successful broodmare and by 2005 she was at an adoption facility looking for a home. 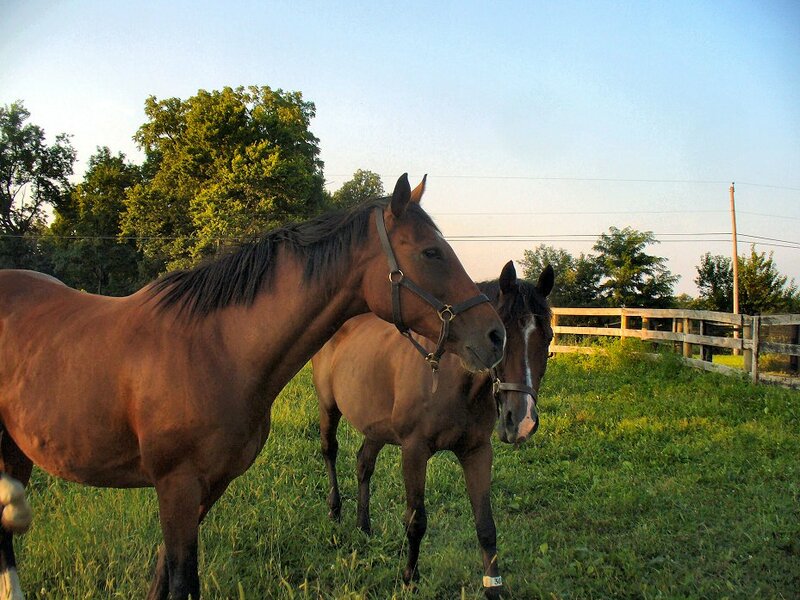 With two other mares, Magic Dot and Hidden Dark, Hope found temporary residences until the three mares came to Old Friends in 2009. For much of her retirement at Old Friends, Ava Lotta Hope was fortunate to receive the loving care of Luann Burton, as did Hidden Dark and Magic Dot. Magic Dot passed in 2011. 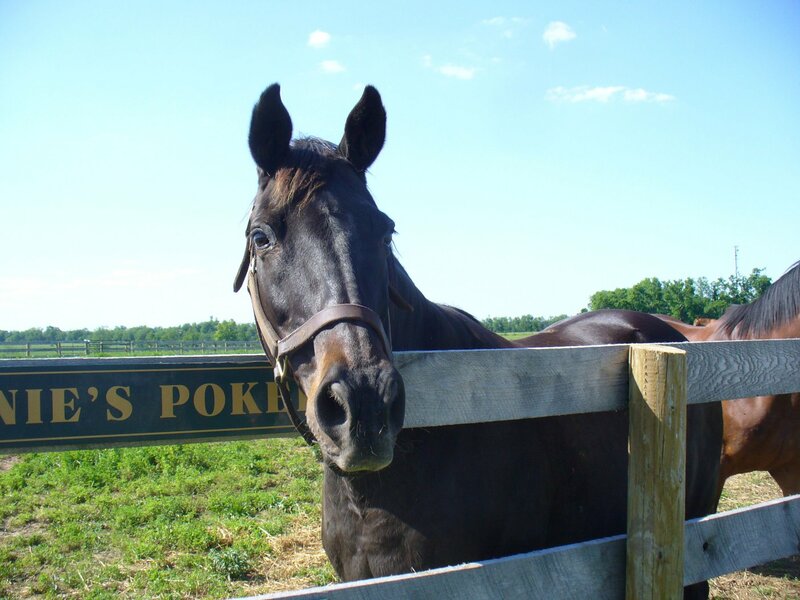 Hidden Dark is living at Dream Chase, the main Kentucky farm. In spring 2014, Hope was the lucky girl chosen as 1997 Older Female Champion Hidden Lake’s special companion. The two shared a tree-sheltered paddock of their own and Hope enjoyed that quiet lifestyle. She formed two other important bonds, with assistant barn manager Carole Oates, who manages the nutrition so beneficial to the oldest residents, and with volunteer John Bradley, who groomed and gave her plenty of praise and petting. Since John was closest to Hope, I’ll end with the words he wants to share about her. Hope and John last Saturday. Photo by Barbara Fossum. Hope wasn’t big or flashy, she never left her mark on the racing world. However, she was sweet, kind, with the soul of an angel. If you spend much time around horses you quickly realize you don’t choose them, they choose you. I was honored she chose me as her friend. I think our friendship made her paddock mate, Hidden Lake, a little jealous even though she has her own special person, Old Friends board member and volunteer Barbara Fossum. 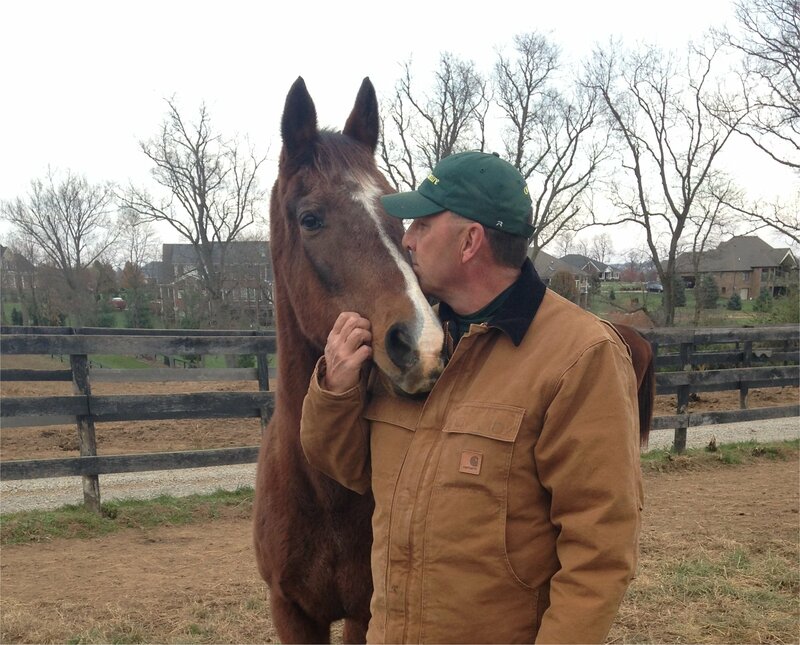 A memory that will stay with me always is how Hope would rest her head on my shoulder while I was brushing her mane. 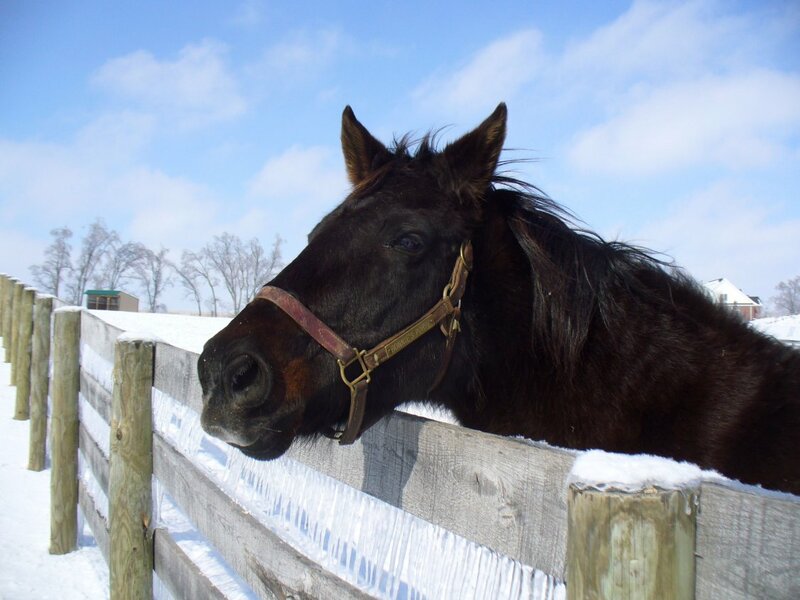 I felt that was her way of saying “thank you for being here for me.” Hope was loved by all farm staff and volunteers, especially assistant farm manager Carole Oates, but she was also special to me. Time will heal the hurt and sadness I’m feeling now, but it can’t erase the love and admiration I will always have for her. Goodbye Hope, I will always miss you, but will never forget you. Ava Lotta Hope, Saturday, Nov. 15, 2014. Photo by Barbara Fossum. This weekend we were saddened by the loss of Max A Million. On Saturday morning Max showed colic symptoms. Dr. Bryan Waldridge quickly administered treatment and Sallee generously spared a van from their full sales schedule to rush Max to the hospital. Max A Million did everything right. No horse could have tried with a steadier, more cooperative determination to survive. Though horse and humans worked hard together, the efforts to save his life did not succeed. Max A Million, a 14 year old gelded son of Jules out of King’s Sweetest by Rollicking, was stakes placed. He ran third in the 2004 Florida Thoroughbred Charities Stakes and held his own on the track for years. When his racing days were over, Topcat Stables and Francis Vitale did right by the horse who had campaigned his whole career for them and ensured his future. Max A Million came to Old Friends in 2008. 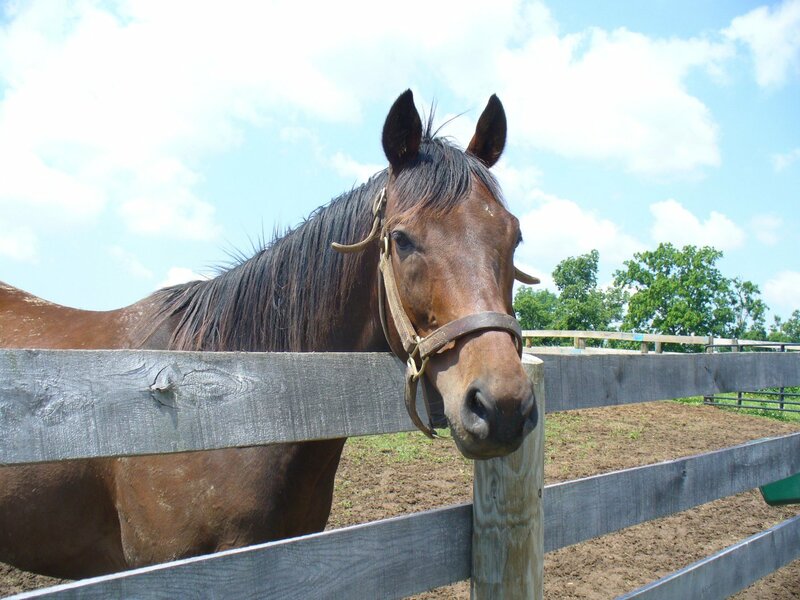 He lived at the main Kentucky farm. Max was a compact bay, not flashy, not big, but handsome. He came as close to the perfect resident as any Old Friends has ever had. He was always kind, always willing and beautifully behaved. Oh, one time he was a little bad when he joined his best buddy Discreet Hero in pestering A. P. Slew. Just once in all his six years with us. Day in and day out, Max A Million was a sociable citizen of his herd and a total pleasure to be around. He and Discreet Hero were always fast friends, and when Max colicked it was Discreet Hero who stood by him until help arrived. Hero is not the only one who will miss Max. In his many good days of retirement and in his final hours, Max A Million showed unfailing heart and kindness. We will all miss him.